Have you ever seen a college professor as gorgeous as Erica Stone? My Lord! She looks like a movie star! When I was in college, there were no professors who came close in looks to Doris Day. Mine were more in the class of Mrs. Trumble on I Love Lucy, or Minerva Urecal, the outraged gossip in By the Light of the Silvery Moon. But when choosing a co-star for none other than Clark Gable, you must keep up with the standards for Hollywood’s King. Miss Day certainly filled the bill, not only in the looks department but also as an equal to her legendary co-star on an acting level. Teacher’s Pet is an intellectual comedy. It concerns a dedicated college journalism assistant professor Erica Stone (Day) who, without having met him, invites a gruff city editor, Jim Gannon (Gable) as a guest lecturer in one of her classes. Opposed to schools – having come up the hard way in the newspaper business, he has declined the invitation, via a scathing letter, to the professor explaining his disdain for book-learned journalism. He is ordered by his managing editor to contribute as least one evening of his time and to apologize for his impudence. When he arrives in the news-writing class, expecting to see teacher Trumble or Urecal, he is pleasantly surprised to see the shapely and beautiful Miss Stone at the class’s helm. Erica, enraged that Jim Gannon has not only refused her invitation, but also that he insulted the teaching profession, berates him by reading his letter to the entire class and innocently mistakes Gannon as a new student. Clark Gable and Doris Day in “Teacher’s Pet” (1958). To hide his true identity, Gannon enrolls in the class under a fake name so that he can attempt to prove his belief that ‘eggheads are teaching amateurs how to be amateurs’. Erica is so impressed with the first story he writes that she encourages him to consider becoming a journalist. A great deal of intellectual conflict exists between them about the field of journalism, but Gannon continues his deception and begins to woo her. When it appears that Erica is involved with a fellow professor, the young and handsome Dr. Pine (Gig Young), Gannon tries to break up that relationship. Gannon is no angel. His most recent female companion is a bimbo-type nightclub entertainer played – or, rather, bumped and grinded – by Mamie Van Doren. (Day’s parody of Van Doren’s routine is one of the film’s funniest scenes.) Erica falls for Gannon, but then fiercely confronts him when she discovers his true identity. Their confrontation scene is priceless. 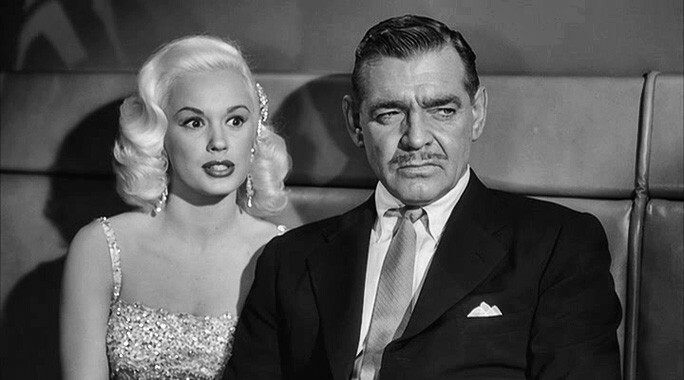 Mamie Van Doren and Clark Gable in Teacher’s Pet. 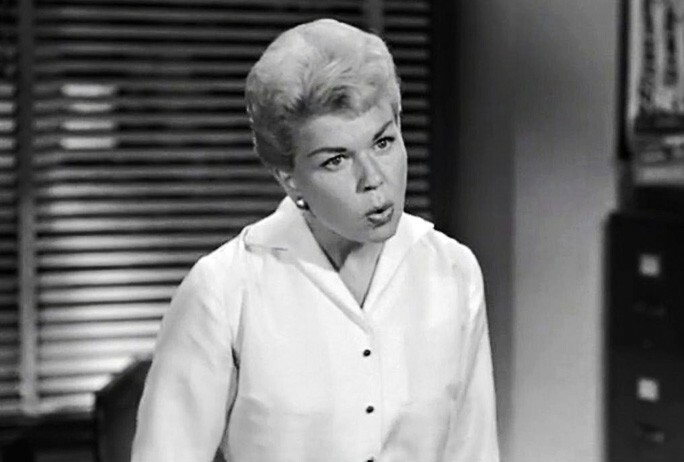 In this role, Doris Day makes you believe that she is actually a professor. Hers is a completely natural performance with an array of emotions, ranging from her strong dedication as a teacher to her confused feelings about Gable’s character. Both she and Gable are effective, and their performances show a true respect for acting. Gable was the consummate professional; after scores of films, his experience before the camera was evident. His scenes in the newspaper office are wonderful and realistic. Although he was always Gable, he had the ability to transform himself into so many different characters. He and Miss Day acted well together; in fact, he brought out the best in her abilities. She understood the importance of this picture and the history it would make. 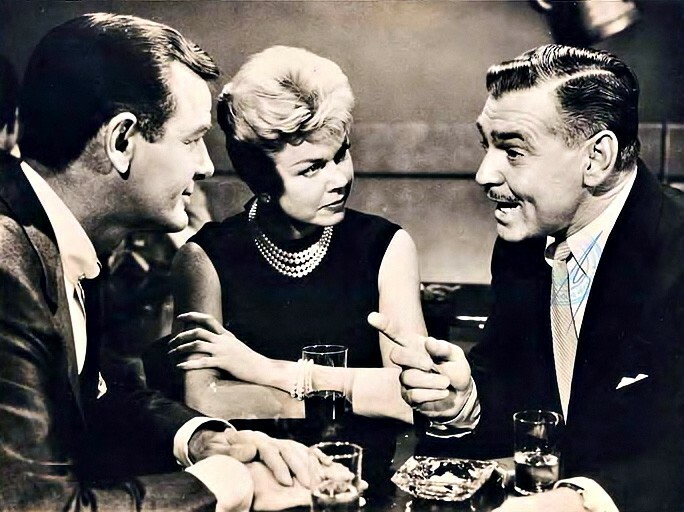 Gig Young, Doris Day and Clark Gable in Teacher’s Pet. Director George Seaton was fortunate to have two of Hollywood’s most talented actors to guide, and he took great care in every detail. Even the supporting players were first rate. I especially liked Gig Young, who deserved his Oscar nomination as best supporting actor. It’s always a pleasure to see Jack Albertson, Charles Lane and Sandra Gould, the latter a veteran of several early Day films. I was moved by bit players like Peter Baldwin as the young writer and former student of Erica’s, and by Vivian Nathan, who portrayed Nick Adams’s concerned mother. Too bad there wasn’t more for the talented Adams in this role, but he shone brightly the very next year with Day in Pillow Talk. 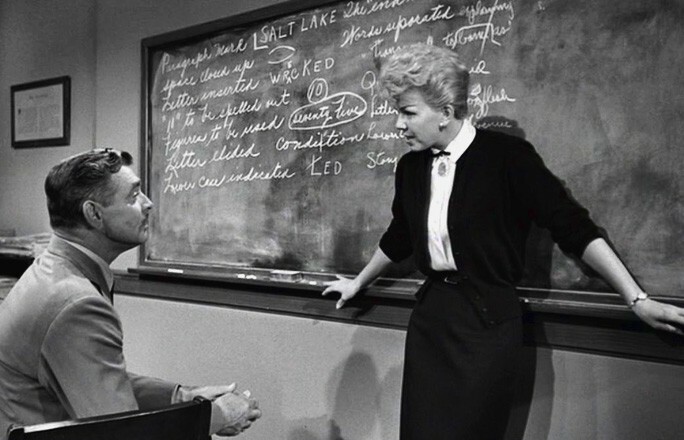 Doris Day in Teacher’s Pet – a very chic professor indeed! Teacher’s Pet is certainly not your run-of-the-mill comedy. Even though it’s thought provoking and delves into social issues like poverty, racism, big city life, education and changing times, the picture is funny. The clever script by Fay and Michael Kanin was tight and kept the proceedings interesting. Edith Head designed Miss Day’s wardrobe, making her a very chic professor indeed. I would have preferred that the film be in colour along with the super VistaVision in which it was shot, however. The film ended up on most year-end’s top 10 lists, including the coveted New York Times. Doris Day had a top 100 hit record with the catchy title song, written by Joe Lubin. Teacher’s Pet emerges as one of Day’s best films; she should be proud of this one. “Once in a great while, a comedy comes along that combines satire, sophistication and farce in one satisfying whole: Teacher’s Pet is just such a comedy. 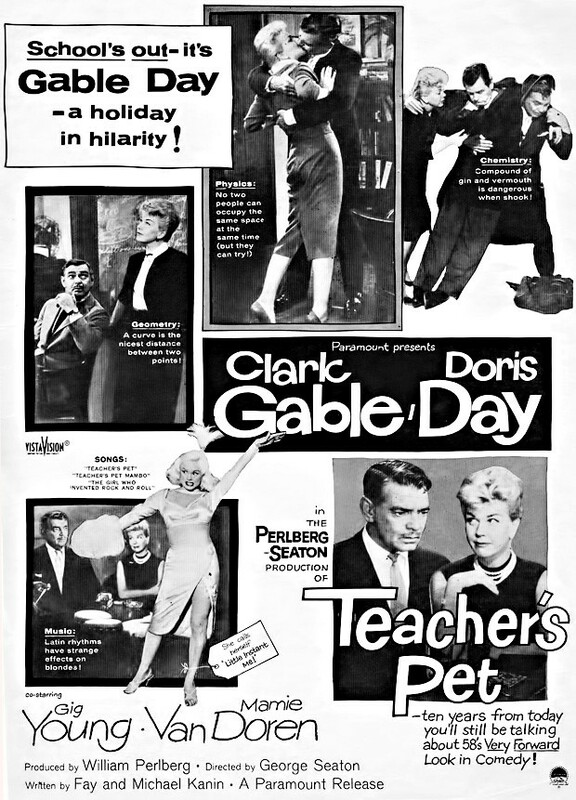 Paramount has teamed bouncy Doris Day and sardonic Clark Gable in this spoof concerning a jaded, know-it-all editor (Gable) and his run-in with a very beautiful professor of journalism (Day). 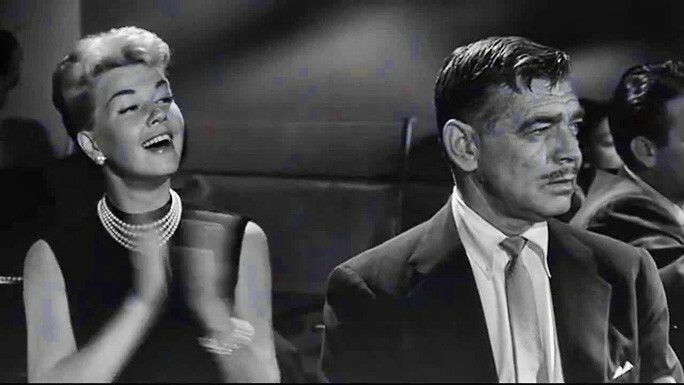 Doris Day and Clark Gable in “Teacher’s Pet”. Striving for authenticity in the newspaper city room scenes, producer William Perlberg and director George Seaton cast 67 members of the nation’s press in the film. Fifty-three of them were flown to Hollywood from thirty-one states and Canada; the rest were from the Hollywood press corps. Norton Mockride, city editor of the New York World Telegram and Sun, was present for the entire shooting to coach the city room scenes. The city room, even to certain smudge marks, is an exact replica of the New York World Telegram and Sun. 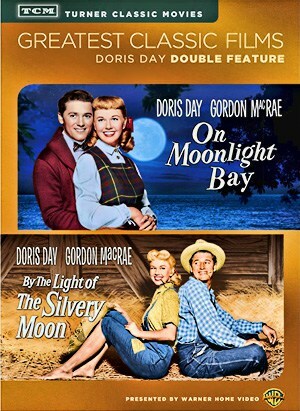 Doris Day won the Golden Flame Award from the California Association of Press Women while the picture was being filmed. The Award was for being cooperative with the press, and in honor of her role as a college journalism teacher. Gig Young’s fingers became so sore while practicing his bongo drum routine; he had to have special sponge padding taped to each finger. Clark Gable was obliged to learn to type with two fingers, newspaperman style, and to accomplish a Latin American dance called the Meringue. Gable’s wife, Kay, a frequent set visitor, kept the company supplied with sweets. She brought homemade popcorn, a half-dozen boxes of chocolates, and even a huge box of fresh pretzels. Doris and her hubby Marty Melcher tossed a party for the visiting press and other cast members at their new Beverly Hills house, although they had not yet renovated it or moved in. The original plan was to stage a garden party and barbecue in the back yard. But thirty minutes before the guests were due; it began to rain so everyone ended up in the furnitureless house, on the floor. 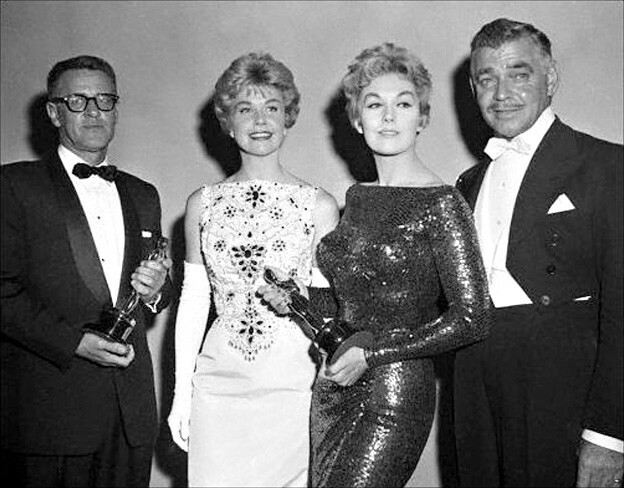 Doris Day with Kim Novak and Clark Gable at the 1958 Academy Awards. 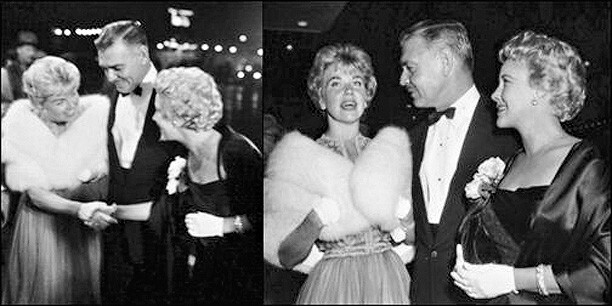 Doris Day with Clark Gable and wife Kay. 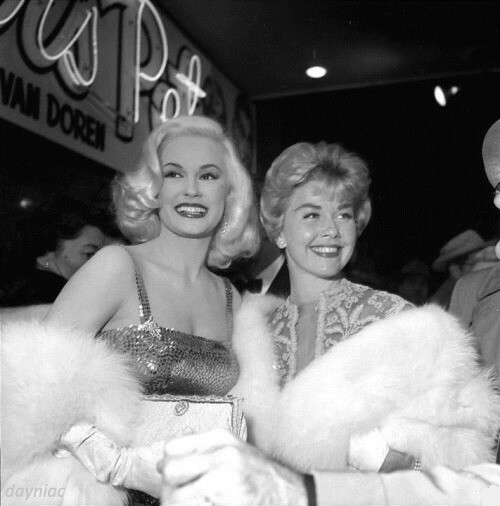 The Mamie Van Doren/Doris Day issue..
Doris Day and Mamie Van Doren, Teacher’s Pet première. Teacher’s Pet was nominated for two Academy Awards: Best Original Screenplay and Best Supporting Actor: Gig Young. It was also chosen as one of the Ten Best Pictures of 1958 by the New York Times.